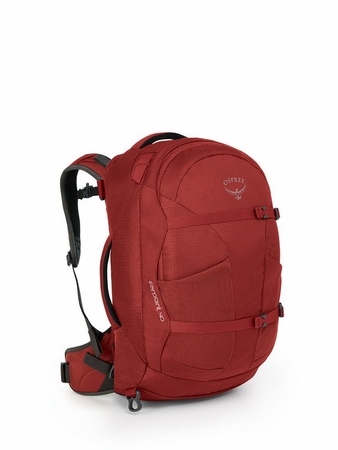 "Osprey�s Farpoint 40 is perfect for a weekend getaway in the city or the wilderness. The LightWire frame suspension transfers the load from harness to hipbelt. A mesh backpanel improves ventilation and the mesh on the harness and hipbelt reduces chafing under load. The entire suspension stows away under a zippered panel creating a sleek silhouette for transport. Outside you�ll find a zippered front panel slash pocket to keep you organized and sewn attachment points to lash on extra gear. No matter how much you choose to carry, StraightJacket compression straps stabilize the load. The padded top and side handles give you purchase when you need to toss the Farpoint 40 into the back of the bus.